With all the pressures put on women in society to look a certain way, or be a certain size, it's always great to find an organization pushing self-worth, self-love, and happiness with who you are....as you are! The National Organization for Women (NOW), a campaign for the Women's Health Project, is fighting back against the media, entertainment industry, and the billions of dollars women spend living up to a predetermined "image". Of course good health is optimal, but the idea of looking like an airbrushed model is not one to pass on to our next generation of women leaders. 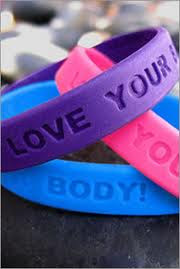 NOW Foundation is celebrating its 12th annual Love Your Body Day on Oct. 20. This campaign is a giant shout out to the fashion, beauty, diet and advertising industries: No more fake images! Show us real women, diverse women, strong women, bold women. And to the women and girls who are targeted by messages telling them that the key to success and happiness is manufactured beauty, we say: It's okay to "Be You" -- the true you is beautiful. NOW is not only hosting events and giving tips on their website about the importance of healthy body images, but getting you involved, too! It's not just about Love Your Body Day, but loving your body at all times! Promote the message! From your community, social organization, and campus, to church, workplace, and especially your home, you can make a difference in the lives of women close to you. Check out the events and information NOW is offering. Help another woman love her body, and always, always, always, LOVE YOURS!!! *If you're on Twitter, you can follow NationalNOW and use the hashtag #lybd to talk about Love Your Body Day and the things you are doing to celebrate! You can also find NOW on Facebook, where we also have a Love Your Body Cause. but thank you for sharing this info.